Gosh what a summer we had, since my last blog post we’ve got up to quite a bit as a family, as Sweet Pea grows. It started off with a trip to The Walled Garden at Beeston Fields to enjoy the lovely Fabulous Places little fair. Sometimes its nice to pop along to events to see how it feels but to also enjoy. I was full of cold that day but a yummy ice cream made me feel a lot better (I did share it with my little one!!) Visiting other events is important to gage if my work would fit in, how far it would be to travel, what customer base there is. At this point I was also illustrating more in my range of grey hares. I now have a series of prints in this range available on my website. These prints are now in stock at The Little Shed, Allestree, Derbyshire. I’ve had quite a few sales and some lovely comments on social media. These really do help me so thank you because its nice to know my work brings joy to others. The development of my little squares of prettiness have also been going well. I’ve had a steady interest in both the floral and hare little square illustrations. I love drawing these and as a collection am pleased with how they are coming on. There have been some personalised designs emailed my way for a wedding, a 40th birthday and special designs for children. We’ve had some wonderful family trips over the summer starting with a surprise to see My First Ballet Swan Lake in Manchester. My daughter has been dancing since she was two and announced to us she’d like to be a professional ballerina! So as she was working towards her first exam it seemed appropriate to take her to see how the professionals dance. It was a moment to cherish when my little one realised what we were watching because we’d kept it a surprise! I love moments like this, it’s what working hard’s really for. Now the weather this summer has been the hottest since 1976 apparently. I am an 80’s baby so this summer has been my hottest to date and wow have we enjoyed it. Lots of paddling pool splashing and bbq’s with family and friends. One of the nicest walks we’ve found has been from our village to one of the neighbouring villages. As we cut through the woods half way there is a tree and surrounding tree stumps creating a fairy home. The large tree has a little red door attached which children post their fairy letters!!! How adorable and a high light for my little one which she shared with her older cousin whom visited. My next adventure was to take a day out to Kirsty’s Handmade Fair with my Mum. It was great to see Jane Kent a fellow artists/maker and to support her too. The show was busy, some fab stands and a few items purchased. We then enjoyed a drive to Stratford-upon-Avon which I’d heard lots about but had never been. Quite a bit of history in this market town and one of the countries busiest tourist destinations. It was nice to visit somewhere new teaming it up with the fair and spending time with my Mum. So for the next few months I was busy getting together stock for the Summer Market at The Roundhouse, Derby, embracing days out along the way and our beautiful countryside. It’s nice when getting together for an event to get all stock out to see how my works progressing and to also mock up the stand every now and then. Also looks great on social media to show my work collaboratively. I have also picked a few original paintings as prints and cards which are now available through my website in both A4, A5 and standard card size. The countryside is as you know now where I get lots of inspiration and it brings me much comfort. 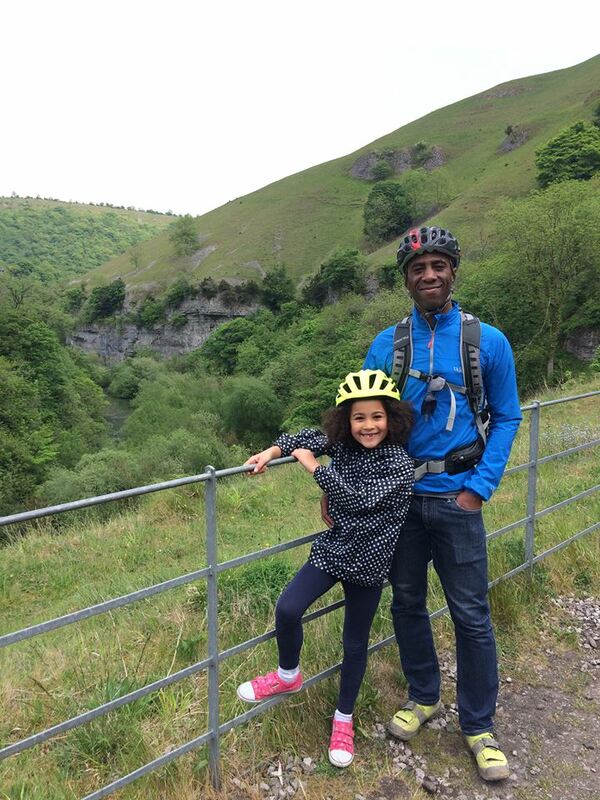 So as a family we’ve been for bike rides along the Monsal Trail outside Bakewell. An old rail track so fab for little ones, I think we managed about 6 miles there and back! The views and hedgerows along the journey were beautiful, very inspiring. May half term came and for a while I’ve been wanting to take a day out to the sea side. For years as a child we went to Anglesey for our holidays. Beaumaris is one of my favourite places, love the little shops, pastel coloured sea front houses, the fab Janet Bell Gallery/gift shop, Snowdon views, fish and chips and it holds many happy memories. So with my little one we got up really early one morning, collected my Mum on the way and went for the day. Even the smells of the sea, the wind and when you come home with sand in the car, its a great experience all round. On Route we popped to Hawarden to the farm shop for breakfast. A unique building filled with unusual gifts, great food, butchery and the building’s made with old steel cladding, very Instagram friendly!!! 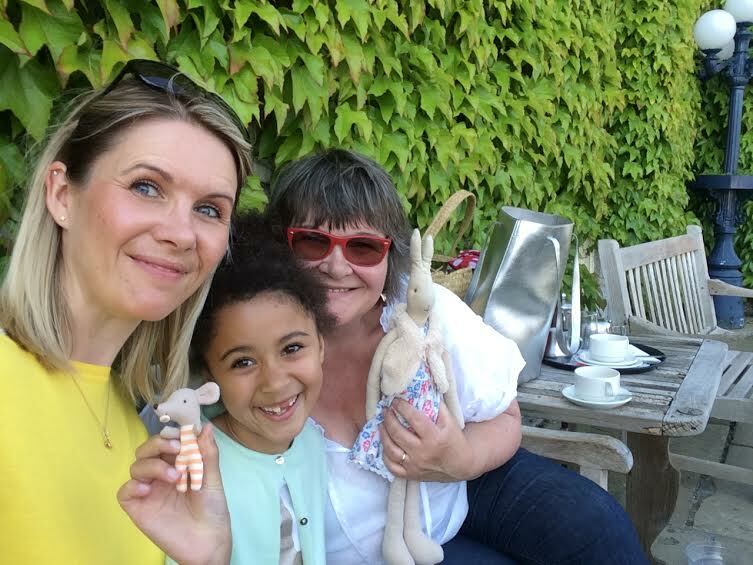 In June I had a very exciting meeting with Anney from The Little Shed. She’d been thinking for a while to ask if I’d like to run watercolour workshops. I was so chuffed to be asked and so we planned the themes and dates to run the first evening class. I’m so pleased it sold out with in a few weeks and even a reserved list. I was quite nervous to run the workshop as I haven’t stood in from of people and presented for some time. The Ladies that booked on were all so lovely, friendly and supportive. They all embraced the workshop, enjoyed the company of the other people and obviously the cake that Anney provided was thoroughly enjoyable! We are now in talks to run further workshops so if you are interested please get in contact. I have also been asked about one to one workshops. So again please get in contact if your interested. 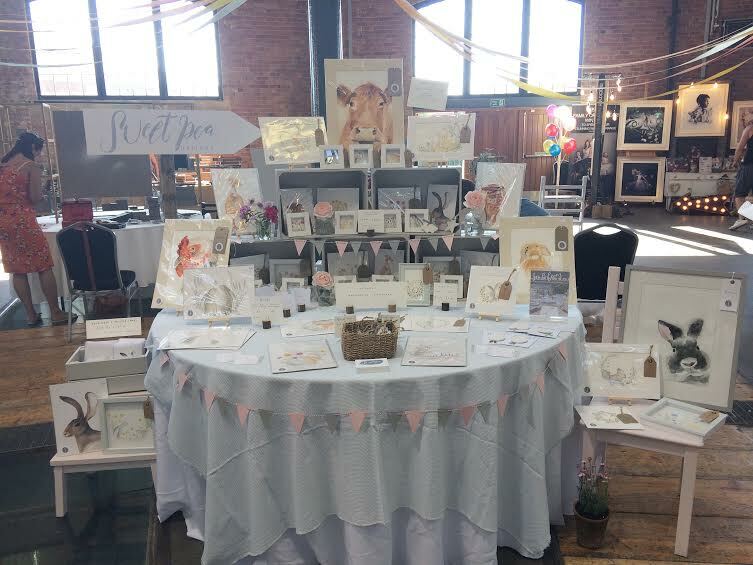 Along this summer journey I was also getting ready and prepared for the Summer Market with Fabulous Places, The Roundhouse, Derby. This time I was located back in the Roundhouse. In the Spring I was located in the Library and I understand regarding Debs feedback the customers that come to the event like to have a change of stall holders so the event feels fresh. I agree with this and either location I enjoyed and did well, the library has actually been my best position to date. So I have now had two stall at the Spring Market, two including this for the Summer Market and one stall for the Christmas Market which is a two day event. I enjoy these events so much and they are a high quality ran market. Deb does a great job and so to be a stall holder again I was really pleased. This Summer Event I decided to change my stand slightly and was pleased with how it looked. I got some great feedback and did well at the event. My VIP idea this time for to produce a limited addition print, for the Spring event I produced sweet pea seedling if you remember? Both have been well received. So the Christmas event this year I’ve decided not to attend for various reason, one being family commitments. So on the Sunday of the market my friend and I are going to be VIP’s which will be fun. It will also be nice to experience the event from the other side and take a look at where I can change or adapt things for the Spring Market 2019 if I am accepted. There are so many gorgeous stalls at this event a great place to shop for Christmas so pop along if your free on the 11th November. After this Summer Market it was time to enjoy our village Carnival. My daughter is in the carnival parade supporting her ballet group. So we walk with her and then she does a dance in the field for all to enjoy. We have it to a fine art now, pop to our local butchers stand for a hot dog, walk around the stalls (Mum and I always buy a new plant for the garden) and enjoy an ice cream. But this year an England football game was on so we had to run home with our ice creams before they melted and watch the game!!! 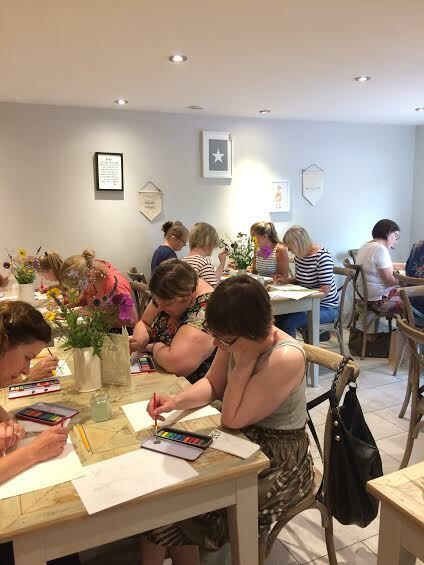 I have attended the Huddle arranged through Deb, Fabulous Places which has been a lovely way to network and meet new people or put faces to Instagram accounts I follow!!! So the second Huddle I went to I met Liz from Lottie Brown a wonderful photographer. 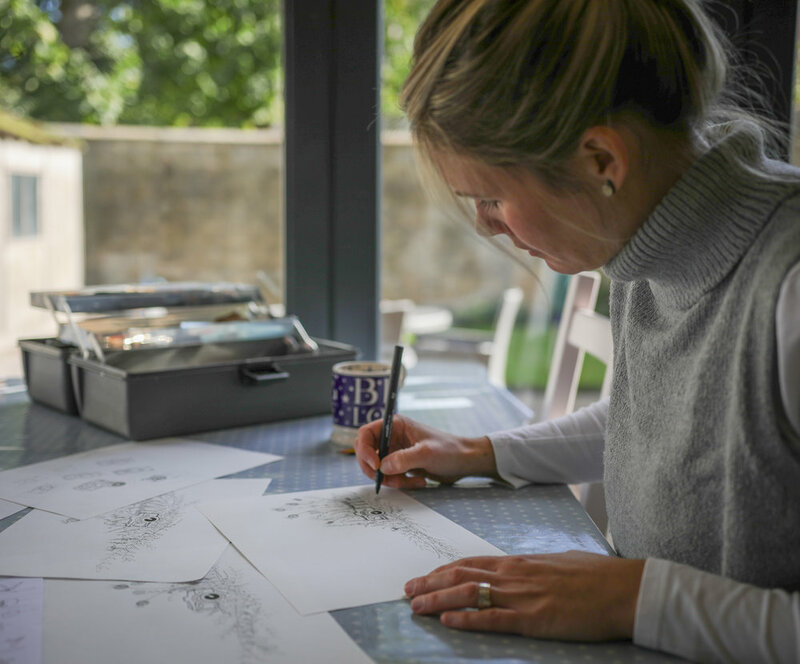 She contacted me after and we met up to chat as she wanted a commission of her family draw as hares. I loved producing this for her family. She was chuffed to bits and has also asked to illustrate her business logo. And in return have had some product photography done with Liz. First a shoot of me at work and in my surroundings and our next meet up will be of my work and lots of these images updated on my website. I enjoyed the shoot so much cause Liz is so easy to chat to and made me feel really comfortable. I highly recommend her. So with Liz’s logo we will be colaberating with the lovely Lisa King because she’s designing Liz’s website. When it’s been digitalised I’ll let you all see how it’s worked together with Liz’s business name. Another logo I’ve designed pictured below was for Kate Marr who is in the process of having throws produced from her sheeps wool. I think now she’s had a batch produced, her logo will be added. So fantastic to see your designs included on garments like this. I’m arranging a meet up soon to have a look which I can’t wait, then I’ll have to have one at home!!! Kate has asked Miss sammie to create her website and so Sammie digitalised this logo I created for Kate. It’s great to work with other designers to collaborate our skills, girl power!!! This summer we planned to travel to London and spend a few days there before camping at Adam Hensons Cotswold Farm. We had a wonderful time in London, visiting firstly my husbands Grandad which my little one loved to see her Great Grandad McVity! We spent the day at Kew Gardens, so lovely to wonder around in the sunshine. My favourite to visit too is Liberty, the follower shop and fabric are just beautiful. The hustle and bustle of the city is infectious, we love London and even though my husband works there every week it’s not the same without his girls. We also took our budding ballerina to see the Royal ballet School. Its good to see where one day your dreams may just come true if you try hard enough. Experiencing the big smock all together as a family is great and we try and do it as much as we can as theres so much to see. Adams Farm as we call it (Cotswold farm Park) is fab, if you ever get the chance to go it’s well worth it. We went camping there 3 years ago and new this summer would be fun camping again. We had the most amazing week and visited the farm nearly every day. The Cotswold farm shops and Daylesford especially we love to visit and have the nicest picnic’s with the food we take back. I love to visit the villages and this year really wanted to visit Sam Wilsons gorgeous new shop in Stow-on-the-wold, just beautiful could have bought everything! After our week camping we planned to collect two new mini lop rabbits on our way home. For the few weeks running up to us going away my husband and daughter had converted her wendy house for the rabbits to live in. It’s worked so well and they are very happy together, we named them Bumble and Crumble! The rest of the summer holidays we met up with friends and family and made the most of the fabulous weather at many wonderful National Trust sites. Throughout these days with my little one work continued and I took part in a new fair at Nevenby. This was a good opportunity to meet new customers and try out another fair in a new area. For a while I’ve had a special piece of furniture, my Grandads fireside chair. He passed away a few years ago and I wanted to keep it and have reupholstered, so managed to organise this with Nicky from Joy Interiors. Nicky and her upholster have done such a fab job and we’re so chuffed with it. A lovely piece now that I can pass onto my daughter in the future. The August bank holiday and husband and I decided to enjoy a few days away to The Lakes. With my little one on a sleep over at her Grandparents, we managed a few walks, one being Bowfell with the most amazing views we’ve ever experienced on a walk of this hight. It was lovely to have some time together just us, re charge the batteries before the routine started in September. Just before school started we also managed a last day out to the Chatsworth Country Fair with a picnic with friends. We hadn’t been before and it was a real traditional country day. Lots for families, the children loved it especially the ride on the Merry-Go-Round, love those traditional rides. Then ice cream and pimms to celebrate the end of the summer. When the weathers good in Britain holidaying here is amazing and it was for us. 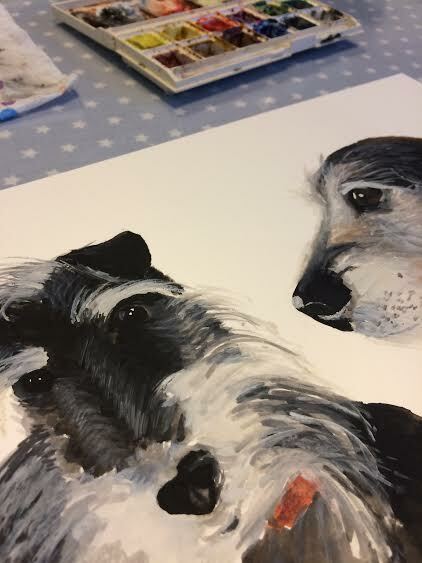 And lastly to end the wonderful summer we had, I was asked to paint a commission for a friends sisters dogs. An early commission for Christmas but very organised! So I popped this round just at the end of the summer and my friend was pleased. For a commission I ask for a few photos of the animal being painted, preferable profile but other views are good too. These two particularly had lots of character which is fun to paint. If you are interested in a commission for Christmas then please feel free to get in contact. I look forward to my next blog, I hope you enjoy reading all we get up to, till next time. 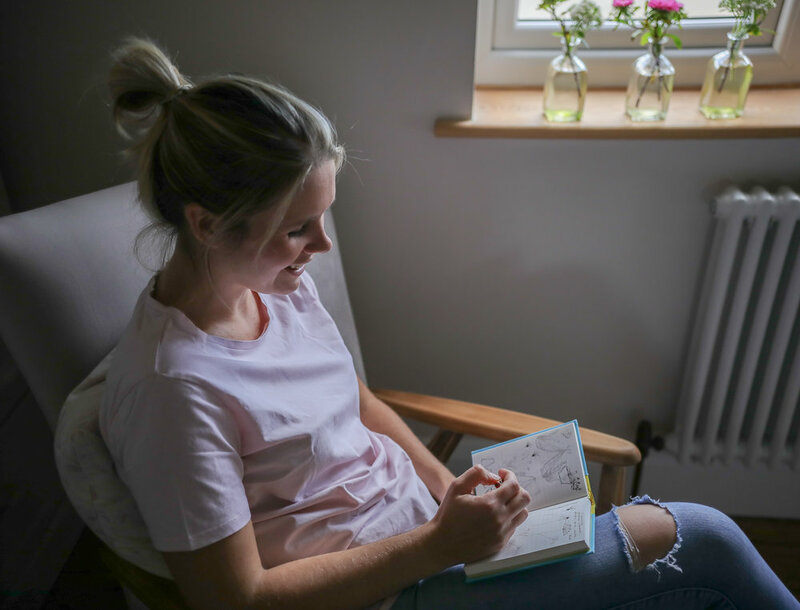 The ramblings and musings of Emma-Jayne, who brings you the wonderful world of Sweet Pea Designs, from the heart of the country in Derbyshire.